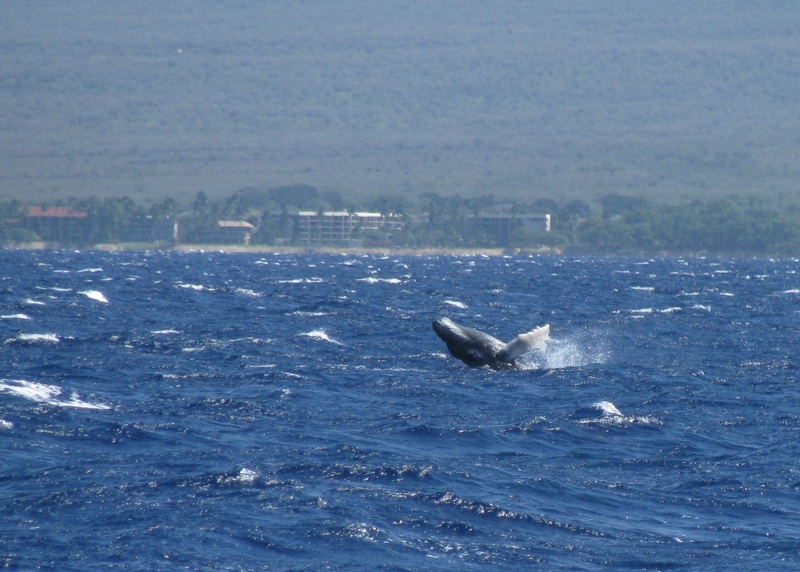 February 15, 2010 May 21, 2014 Joanna V.
On Saturday, J and I flew to Maui to go whale watching. This sounds like a little bit crazy, especially since we didn’t spend the night, but Hawaiian Air offers reasonable prices for island hopping and it would’ve been expensive to stay somewhere on Maui, as it’s got a lot of resorts and things. Anyway, we landed in Maui around 7:45 in the morning, picked up our reserved rental car (which turned out to be a Jeep, surprise! ), and headed south to Ma’alaea Harbor where our tour started. Along the way… No, actually, about five minutes away from the airport we found the only Krispy Kreme doughnut shop in the entire state, so we stopped for “second breakfast” and had a doughnut. It was wonderful. Then we headed south to Ma’alaea. Maui is shaped somewhat like a peanut laying on its side, and the airport is in the part to the north that would be the middle and the harbor is in the south of the middle, so it only took us about 25 minutes to drive the whole width of the island there. The eastern and western halves are the big round bits and would’ve taken much longer. Turns out the western and southern part of the island don’t get much rain, either, as it was not only sunny and hot the whole time we were there, but we didn’t see too many trees or flowers or anything. That must all be on the eastern half of the island, where the black sand beaches are. We need to go back and see those. Our boat left from the harbor around 10:30 and we just went around the bay because there were whales everywhere. I didn’t realize they came so close into the shore, but apparently they’ll come into water shallower than they are long– and since they’re the length of school buses, that’s still pretty shallow water. We saw several types of “typical” whale behavior, like diving with their tails up, slapping the water with their pectoral fins, and just hanging out along the top of the water so we could see their backs. We also saw some not quite as typical whale behavior, which was really cool– we saw a pair of males competing for a female, which involved bumping into one another and blowing bubbles. I’m sure it’s very fierce looking to the whales. We had a biologist on board who explained that the main purpose of bumping into each other and blowing bubbles and churning up sand and such is to make it so the other male can’t see anything so that the one making the distraction can scoot away with the female for a few minutes. After we left the little “competition” group, we moved farther out into the bay and saw whales completely breaching from the water (check out that link!). It’s pretty amazing to see a whale jump completely clear of the ocean and then crash down into the water. I wasn’t able to get a photo, but it happened several times and was just amazing. The other awesome thing about this time of year, and the main reason we went now and not this summer, is that this is breeding season for the whales, and also the time when the calves are born. We saw two whale calves in the bay, both born in the end of January or so, and both playing along the top of the water since they can’t hold their breath all that long. The photo at the top is of one of the calves. They were doing all the fun whale behavior, too, except being so small they weren’t quite as good at it. It was so amazing to be that close to them, though! After our whale watch, we went to a place called Buzz’s Wharf that was recommended to us by the guy at the rental car place and it turned out to have very good seafood. Then we went to the Maui Ocean Center, which is one of the best aquariums we’ve seen. From there we decided just to drive along the coast for a while until it was time to head back to the airport. 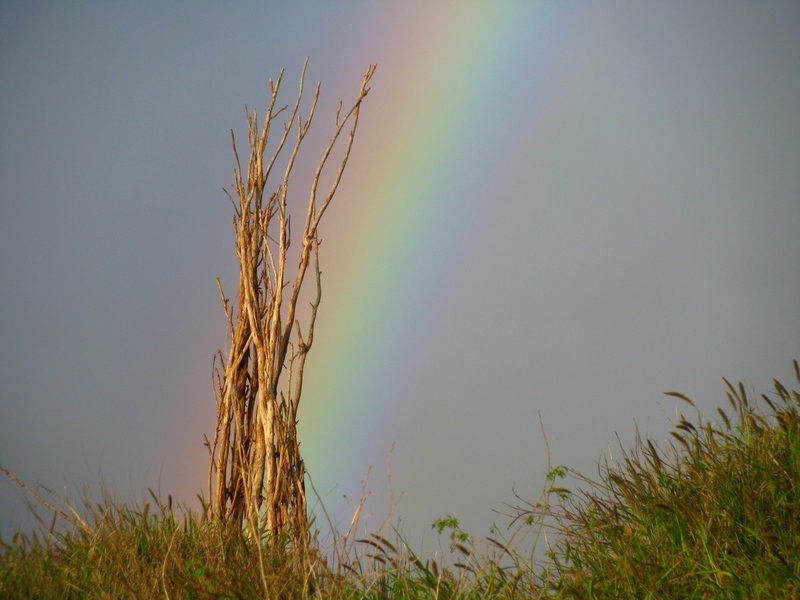 We saw most of the west coast of Maui (which, as I said, is the dry part) and saw some amazing rainbows and a nice sunset. Then we turned back toward the airport. The trip back was uneventful and I slept through most of it. We got home exhausted and sore from all the walking (and standing on a moving boat) we’d done, but it was well worth it. I think the next time we go, though, we’ll head to the east coast, and the black sand beaches and rainforest. There are rainforest and waterfall tours you can take there that look fascinating. We want to see as much of Hawaii as we can while we’re here, after all.